David Garfield - Charged Particles: Jazz with a Spark! 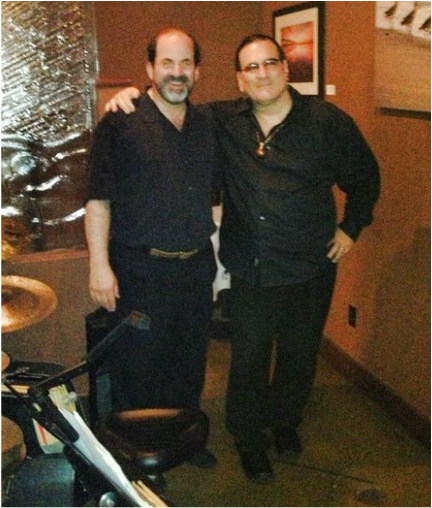 Charged Particles performed with pianist David Garfield (Music Director for George Benson, producer of more than 50 albums) at Bellavino Wine Bar, Westlake Village, California., and on various performances in the Los Angeles area subsequently. David Garfield's mission statement is "I make music." And "make music" he does, as a world-renowned keyboard artist, producer, and composer. Be it jazz, rock, funk, or world beat - he is the creative force behind the production of many internationally acclaimed recordings. Whether working as a Musical Director for other artists or Performing or Recording with one of his own bands, David (known to some as "Creatchy") is constantly and consistently involved in creating music for the listening enjoyment and pleasure of music lovers everywhere. "Giving Back" is Garfield's most current Creatchy Records release, which once again features world-class musicians and artists. Recorded in both Los Angeles and New York, these 13 hot new tracks reflect a fresh direction for his West Coast Sound. Enjoying regular air-play in the U.S., Japan, Europe, and Australia, the response to "Giving Back" has been overwhelming and its popularity with listeners continues to grow David's international fan base. The extraordinary release Tribute to Jeff, a 80 member all-star memorial to famed Grammy winning drummer Jeff Porcaro, marks David Garfield's solo debut under his own name. The album's fascinating breadth of styles, arrangements and top name band member contributions are a fitting culmination and reflection of Garfield's three decade plus career-span notable for his amazing genre-to-genre diversity, all-star collaborations and success as a lead performer, composer, arranger and musical director for some of popular music's leading artists. Garfield has one of those who's who, what's what resumes that begs the question, what HASN'T he done? Over the span of his career, he's scored and recorded for films ("Annie," "Always" with J.D. Souther), Television ("Fame" and its five accompanying "Kids from Fame" recordings), and commercials (Coca Cola, McDonald's, Seven Up, Mitsubishi). He's produced over 50 albums and appeared on over 100, with such artists as Cher, Boz Scaggs, Larry Carlton, Spinal Tap, The Manhattan Transfer, Keiko Matsui, The Rippingtons, and Smokey Robinson; performed with Earl Klugh, Michael McDonald, Nancy Wilson, Oleta Adams, Brenda Russell, Dianne Reeves, and Michael Bolton and was musical director for George Benson (from 1986-90, 2000-2004); appeared on The Tonight Show, Arsenio Hall, Solid Gold, Jimmy Kimmel, The Ellen DeGeneres Show, and Soul Train; and has composed and recorded hundreds of original compositions. 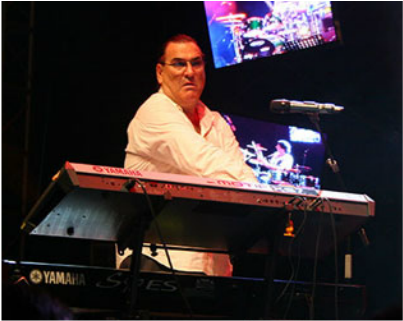 As if that array of challenges weren't enough to satisfy his creative urges, Garfield has led several popular rock / jazz / funk / world beat fusion bands in Los Angeles since his arrival in the mid-70s. The first of these was Karizma, which he formed with top session players Carlos Vega, Lenny Castro, Mike Landau and Jimmy Johnson. Karizma played sold out club dates in L.A. for years and released six albums to great success in Japan, Australia, and throughout Europe. There have been many incarnations of the band over the years. One version which was David with Vinnie Colaiuta, Neil Stubenhaus, and Michael Landau was recorded live at the Modern Drummer Festival 2000 and is available as a DVD. This is currently the only publicly available footage of the band. Some of the highlights for Karizma over the years have been the release of their first CD in 1983 in Japan, appearance at Sadao Watanabe's Bravas Club in 1986 with Jeff Lorber and the Yellowjackets, use of their first single "Say You Will" for the Nissan Sylvia car campaign, two European tours in 2000 and 30th Anniversary tour of Japan in 2005. Garfield and longtime friend / collaborator, percussionist Lenny Castro, formed Los Lobotomys in 1985 along with Toto members Jeff Porcaro and Steve Lukather, bassist Nathan East, and reedman Brandon Fields. This band has also met with great success in L.A. and abroad. In 1994, Los Lobotomys released its second CD "The Candyman." The project featured Fee Waybill from the Tubes and drummer Simon Phillips (The Who / Jeff Beck) and the band embarked on a sell out tour of Europe and Japan, sharing stages with Peter Gabriel, Aerosmith, and others. As is typical of his musical resume, Garfield has worked on a number of unique projects over the past few years, both at home, in Europe and Japan. The Los Lobotomys tour led to a scoring assignment on the German TV show "Balko", and he has produced various Japanese artists in addition to working with top Italian singing star Eros Ramazzotti. Garfield has also performed at Keyboard Magazine's 20th Anniversary Concert at the NAMM show alongside Bruce Hornsby and Joe Zawinul; played at the Modern Drummer magazine's anniversary concert with Steve Ferrone; sat in with Isaac Hayes and The Blues Brothers at a House of Blues benefit concert; released two instructional videos on how to play rock and roll keyboards and released a book, Pop and Rock Keyboards. He's also written and / or recorded background music for the syndicated TV shows "Sentinel," "Gideon's Crossing," "Good Day L.A.," and the trailer for the Billy Crystal - Robin Williams comedy "Father's Day." In between these gigs, he was always writing, recording, and performing his own music. Garfield also formed a production company, Creatchy Productions. With access to the top studio musicians and state of the art technological equipment, they have offered modern production values to both commercial and experimental projects. Creatchy Productions has produced numerous projects for various artists, Television & Films. By continuing to delve into new technologies and to craft world music with Contemporary Jazz and Vocals, Garfield has secured his niche as an international visionary in contemporary music. At first glance, all of these diverse projects may seem to have little in common with his earliest gigs touring and recording with Willie Bobo, Freddie Hubbard and Tom Scott. But in his 40's, the Chicago born, New York and St. Louis bred Garfield can summarize his entire, admittedly all encompassing, career in three simple words: "I make music. That's my mission statement. Things developed slowly over time, till I was playing every different kind of music in unique situations. Always going against the grain, doing music that may not have been the in thing at the time but hanging around until it became popular". "It all goes back to when I was seven years old, first learning the piano," he adds. "There seemed like a great spiritual connection there, and I felt compelled to keep playing. I started my life playing rock, Led Zeppelin, Grand Funk and started meeting more and more jazz musicians in St. Louis which made jazz a logical second love for me. It's been an incredible education." Currently living in the Los Angeles area, David always strives to expand his talents while pursuing a wide range of activities whether it be performing with his own bands, as a guest player with other popular artists, or producing artists / groups such as Oleta Adams, Flora Purim, and Los Lobotomys. In addition, he writes and produces his own music and is looking forward to several new Creatchy Records projects to be released in the coming year. Due to Garfield's diverse musical background and versatility, he has earned the respect of both his peers and critics alike and is one of the most in-demand musicians in the world today.